Today we are going to look at how Azure Logic Apps can be leveraged with Microsoft Dynamics 365 for custom integrations and event triggers. You can get an overview and see documentation on logic apps here. Azure Logic Apps are similar to Biz Talk (on premises version). There are multiple connectors and Dynamics 365 is one of them. Please note that some of the actions in the connector are still in preview mode. Azure Logic Apps and the Dynamics 365 connector behave in a notification style mechanism, which means that record create/update/delete will be notified and the corresponding actions can be taken. In fact, Microsoft Flows are just built on top of logic apps. It also has connector to Dynamics 365 for Finance and Operations as well. Asynchronous Methodology to push data out of CRM. Can be created as an HTTP trigger as well which acts like an API on top of CRM API. API can be created with just configuration and workflow. HTTP Connector can be used to talk to CRM Web API through OAuth tokens. Lot of other Azure stack components can be further used with-in built connectors. Can be used as an async mechanism for Integrations/Publish and Subscribe Model. Load on CRM can be removed. Rather than using async plugins/workflows to publish/send data, logic apps can be leveraged. 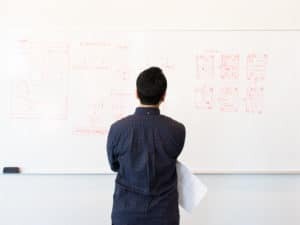 Monitoring can happen at the logic app level using the logic app management on OMS (Operations Management Suite) which is log analytics within Azure. Failure alerts can be setup based on any failed runs and these failed runs can be resubmitted. The Retry mechanism is available at each action level (limited to certain status codes). Run History provides insight on how many have successfully succeeded, failed, etc. No coding is involved. It is all defined as a workflow definition language that is JSON in the backend. The Logic Apps Designer also helps us define the workflow/process. While setting up the logic app, you can also set up the logging to OMS (log analytics). This can be developed in the Azure portal or from Visual Studio as well. Azure Logic Apps Tools for Visual Studio 2017/VS 2015 has to be installed for Visual Studio Deployment, this is an extension. Build Process can also be automated through VSTS build/release definition process, these pretty much behave like ARM (Azure Resource Manager) templates. Parameters help us moving the same logic app to different environments through build definition. Cost is per execution of action/connector (runs under a consumption plan). However, if we use the resources wisely then this can be reduced. Pricing information can be viewed here. There are some limitations with the Party list field. Some of the fields do not show up as part of the context. Any update on the record will trigger the logic app, there is no filtration at this point. Lookup names are not part of the context. The ID comes as part of the context which can be used to retrieve the name or other fields from the related records. 1000 retrieve/get calls per 5 minutes to the CRM API. You can view other limits here. 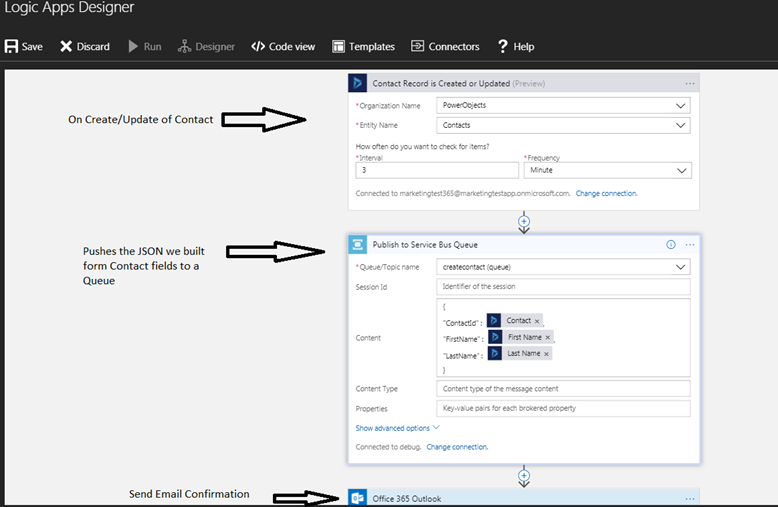 Here are some screenshots of how these look for a flow that triggers on contact create/update, pushes the data into an Azure Service Bus Queue, and then notifies the user that it has successfully sent the message through email. This is just one sample but there are be many more that can be achieved with logic apps. See more about using logics apps with Dynamics 365 here. If you’re looking for more updates about Microsoft Dynamics 365 – subscribe to our blog!